As some readers know, I am currently on research leave (commonly. but incorrectly. called “sabbatical”) from my teaching at the Dominican School of Philosophy in Berkeley. The project I have been working on will, I hope, result in a history of the non-ordained Dominican brothers. Today these brothers are normally called “cooperator brothers,” but in the past they were referred to as “lay brothers” (in contrast to priest brothers, who are “clerics”) or, most commonly in written documents,conversi (singular conversus), a word hard to translate into English, but basically meaning an individual who has undertaken a “conversion” of life to live like a religious, often within the context of a monastery. In our order, however, conversi (lay brothers) made solemn vows and were not mere affiliates of the order, but brothers in the same sense that the clerics are and were. One of the surprises for me during this research was to discover that there is no contemporary evidence whatsoever that the great Dominican saint Martin de Porres (1579–1639) was ever a lay or cooperator brother. The usual version of the saint’s life (for example, in Butler’s Lives of the Saints, the New Catholic Encyclopedia, Wikipedia, or even Giuliana Cavallini’s biography prepared for his canonization in 1962) says that originally Martin was first a member of the Dominican Third Order who was permitted to live in the Dominican community, what was and is still called a donatus, which might best be translated “oblate,” a term usually associated with the Benedictines. Then, because of his holiness, he was supposedly allowed to make profession as a lay brother, the date usually being 1603. This struck me as strange, as the oldest painting of the saint, reproduced in this post, does not show him in the habit of a conversus or lay brother. Rather, he is wearing the habit of a tertiary. Modern members of the Dominican Laity do not wear a habit, unlike those before the 1700s. The reason is that before the late 1700s all Dominican tertiaries made a promise of celibacy. They were in a loose sense “religious” as we now understand the term. Their habit was a white tunic bound with a leather belt and a black cape or mantle. They did NOT wear a scapular of any color. Contrary to the usual images and statues, this is how St. Catherine of Siena dressed, as can be seen in the oldest painting of her by her contemporary Andrea Vanni, which I also reproduce in this post. She correctly wears a white (tertiary) veil, no scapular, and a black mantle, just like Martin de Porres in the famous painting. Technically in the language of the time, Martin would have been a “religiosus donatus” or a “tertiarius professus.” The former term, donatus is still used for men who have made promises as a member of the Dominican laity but are allowed to live in a Dominican community and wear the modern clerical (white) habit. Therein lies a problem that had been bothering me. After his supposed profession as a lay brother in 1603 at the age of 24, Martin de Porres, would not have worn a tertiary habit. When professed, he would have worn the lay brothers’ habit, which, in his time, had a gray scapular. The lay brothers’ scapular was changed to black in the late 1600s, after his death. Nearly every painting and statue I have ever seen of Martin shows him, anachronistically, with the “modern” black lay brothers’ scapular. But the problem with the painting is that it portrays Martin in late middle age, not in his twenties, and he is still wearing the tertiary habit. 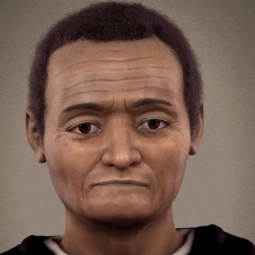 That the image is accurate is shown by a modern reconstruction of Martin’s face based on forensic reconstruction from his skull. I have also included a photo of that reconstruction to the right.You can read about this here. If accurate for the face, even more so for the habit. So, now the problem: why isn’t the elderly Martin wearing a lay brother’s habit? In the course of my work, I discovered the startling reason. After Martin’s death, his obituary was included in the acts of the Dominican General Chapter of 1642. When I reached those acts in the nine-volume Latin edition of the “acta” of all the chapters from 1220 to 1844, I was shocked to find that he is not called “conversus” but rather “donatus.” The text reads: “In provincia s. Ioannis de Perù in conventu Limensi ss. Rosarii obiit vir mirae virtutis et santimoniae fr. Martinus de Porres, donatus,” That is: “In the province of St. John [the Baptist] of Peru, in the priory of the Holy Rosary in Lima, a man o f great virtues and holiness died, brother Martin de Porres, donatus.” Note it does not say “conversus” that is “lay brother.” And this is not an accident. The same acts also give obituaries for two holy lay brothers of the Province of Peru, and it calls them “conversus.” This led me to try and find any evidence that contemporaries referred to St. Martin as a lay brother (conversus). I found none. Instead, I find that the life composed in Spain at the time of the first move to canonize him in 1675 specifically calls him “de la tercera Orden de N.P. Santo Domingo” (“of the third order of Our Holy Father Dominic”), not a lay brother. And the process of his canonization published in 1686 calls him “religiosus donatus professus” (“professed oblate religious”), not “lay brother.” I have not found any evidence that anyone ever referred to him as a lay brother before the twentieth century. In fact, at the time of his beatification in 1837, the life prepared for that process (which is available online) specifically calls him “terziario,” a member of the Third Order, not a lay brother. So where did the idea that he was a lay brother come from? I suspect, and this is just a guess, that, it happened when statues started to be made of him after his beatification, like that reproduced on the left. It was natural to portray him like a nineteenth- and twentieth-century donatus, who would have worn the “modern” lay brothers’ habit. No one would have remembered what a seventeenth-century tertiary habit looked like, just as they would not have known what a lay brother’s habit of Martin’s time (gray scapular and a large black poncho rather than the moderncappa or cape) would have looked like. So the saint’s image in modern art is, I suspect, the origin of the mistaken idea that he was a lay or cooperator brother. UPDATE: I now have found more information on St. Martin’s status. The Lima Process for his canonization, containing witnesses questioned in 1660, 1662, and 1671 (ed. Valencia, Spain, 1960), consistently refers to the saint as “religioso donado,” as do the later documents I have already cited. But the testimony given in 1683 at Lima by Bernardo de Medina, who wrote the first biography of Martin, reads as follows: “sa’ che il detto servo di Dio Fra Martino de Porres fu religioso donato professo dell’ordine de Predicatori, e che in quanto ad giorno, mese, e anno che ricevette l’abito e professo’, si rimette ai libri delle profezioni.” That is: “He knows that the said servant of God, Bro. 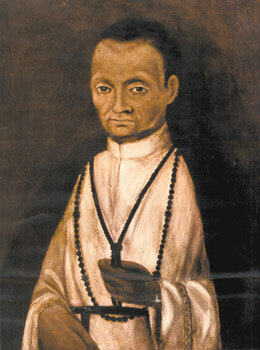 Martin de Porres, was a professed oblate (donado) religious of the Order of Preachers, and as to the day, month, and year when he received the habit and professed, one may refer to the books of profession.” What this profession entailed, is explained in the Summarium prepared in 1732 as part of his canonization process. It reads as follows: “Vix quindecim annos natus Ordini S. Dominici tamquam donatus seu tertiarius laicus nomen dedit, ac post noviciatus annum, ad sollemnem trium votorum professionem, quod perraro hac tempestate donatis concessum est, die 2 iun ii anno 1603 admissus fuit.” That is :At about the age of fifteen years, [Martin] give in his name as a donatus or lay tertiary, and after a year of novitiate he was allowed on June 2, 1603, to make solemn profession of the three vows, something very rarely permitted to donati at that time. I quote these texts from Acta Sanctorum 68 (Nov. III): 111, 115. So St. Martin’s status is now clear. He was not a conversus or lay brother, but a tertiary oblate (donatus), however one who was granted the privilege of making solemn vows as would clerical friars, lay brothers, or cloistered nuns. But he did so while remaining a donatus and not thereby changing his category to that of a lay brother. So, the profession of 1603 and his tertiary habit in he painting are now both explained. All that remains to trace is the origin of the erroneous identification of him as a lay brother, something that seems to be 20th-century. Now (Aug. 28) another update! I just got a copy of Celia Cussen’s book Black Saint of the Americas: The Life and Afterlife of Martín de Porres, which came out from Cambridge Univ. Press in 2014. This is a major work and the first “historical” study of St. Martin. She correctly identifies him as a donado. The “afterlife” section includes a review of images of the saint in art. These show, with one interesting exception that up to the 1800s he was always shown in the tertiary habit, not the lay brother’s habit. The one exception she considers 17th-century, but it is “anonymous” and “whereabouts unknown.” If it is authentic, it is the earliest example of the mistaken habit. Oddly, Dr. Cussen does not notice the discrepancy. I urge those intenersted in Martin and his remarkable life to take a look at this book. It seems that I am not the first to wonder about whether St. Martin was actually a lay brother.